Four brightly coloured cups, four plates and a sugar bowl as well as a milk jug and a tea pot. 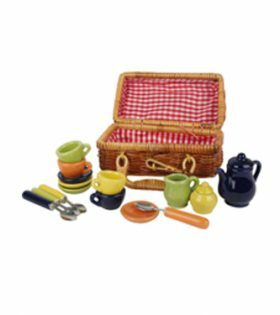 The basket can be taken everywhere and when combined with a picnic mat it is ideal for a party in a meadow or your own garden. A little lovers set for the doll’s and plush toy tea party. 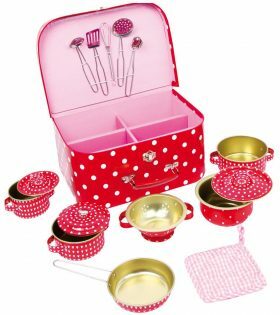 Four cute dotted cups in three colours, four plates, sugar and milk can and a teapot made of ceramic, colour-matching spoons ? 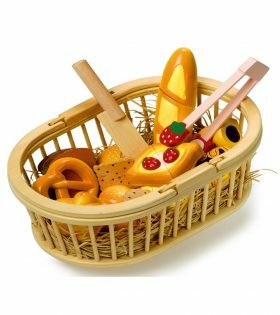 all packed in a beautifully shaped basket made of woven plastic with a handle. Beautiful basket made of cardboard with a solid lamination and a metal handle. The bright red and white spots are a perfect match to the heart motif of the crockery! It?s fun playing with it using 1 potholder, 4 metal pots, 1 colander, 1 pan and 5 kitchen helpers! Pretzels, bread rolls, baguette, cake and all sorts of other delicious treats ? altogether 14 different goodies to be cut and sliced. These are all presented in a wonderful attractive wooden basket with foldable handles. And, of course, 1 knife and 1 pair of serving tongs are also included. 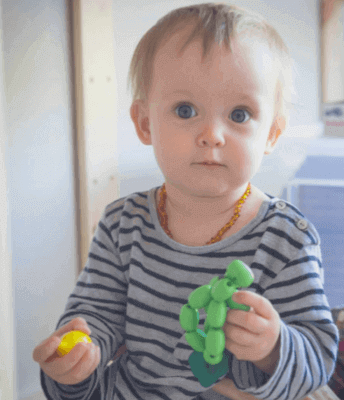 Yet another fantastic article in our range of cutting tools for the children?s kitchen. It also adds another facet to our selection of picnic baskets.